May you believe and let Him fill you with joy and peace. He is the greatest gift and the gift is free. This prayer and Christmas greeting comes from me and my husband. We are both grateful for how you have been wrapping your loving arms around us in prayer these past months. My husband has safely reached his destination and so far we've been able to connect daily...a blessing from God. 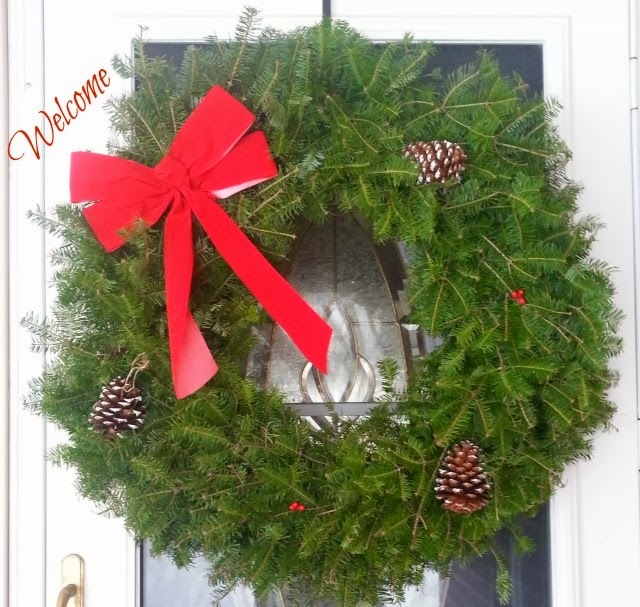 Over at The Nester many blogger's are sharing a tour of their Christmas home. Two dear friends, Kristin and Barbie, inspired me to join in. 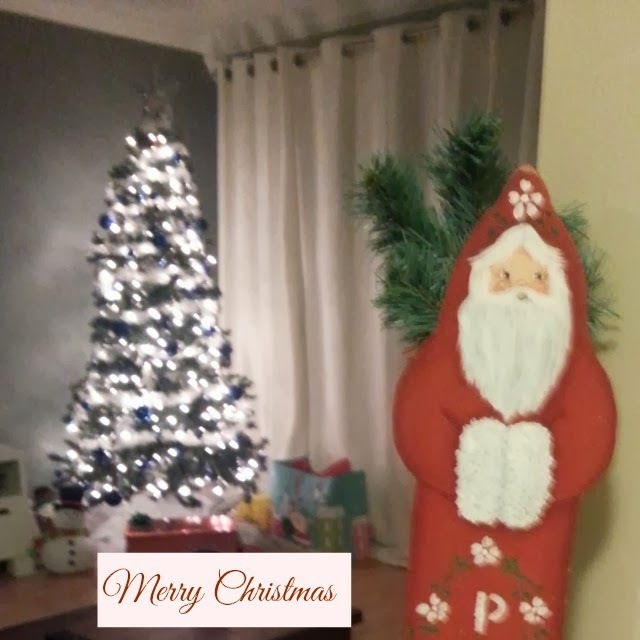 I'm not sure if I will link up but I thought I would still share with you a bit of my Christmas. My simple Christmas that is. The wreath has significance as I purchased it to lay at the grave site of a friend of my dad's who was killed in the Vietnam War. We were unable to get to his grave site this year so instead I have hung the wreath in his memory. If you happen to be visiting my place for the first time, this will be a difficult Christmas for my family as my husband is currently deployed. I ask you to please pray for our service members and their families who will spend Christmas apart. Thank you. 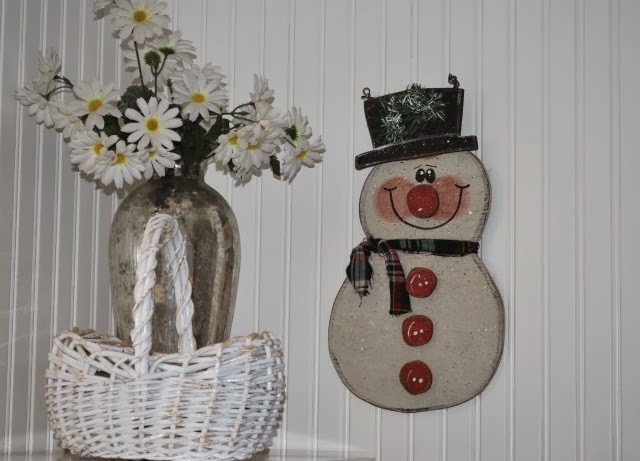 You will quickly discover I have a thing for snowmen. I'm not sure why. There are not many winters I recall being outdoors building snowmen as I dislike being out in the cold. 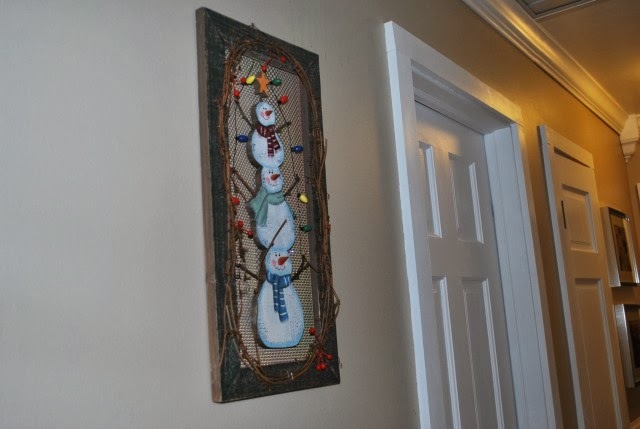 Nonetheless, my Christmas theme is primarily snowmen. I also keep things very simply in my home so decorations are kept rather simple. 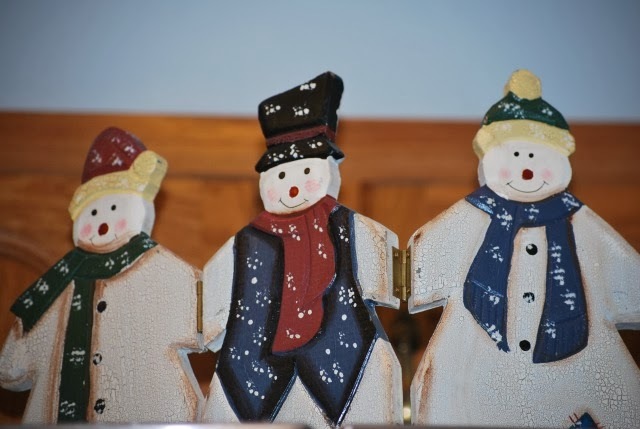 These three snowmen sit above the refrigerator. 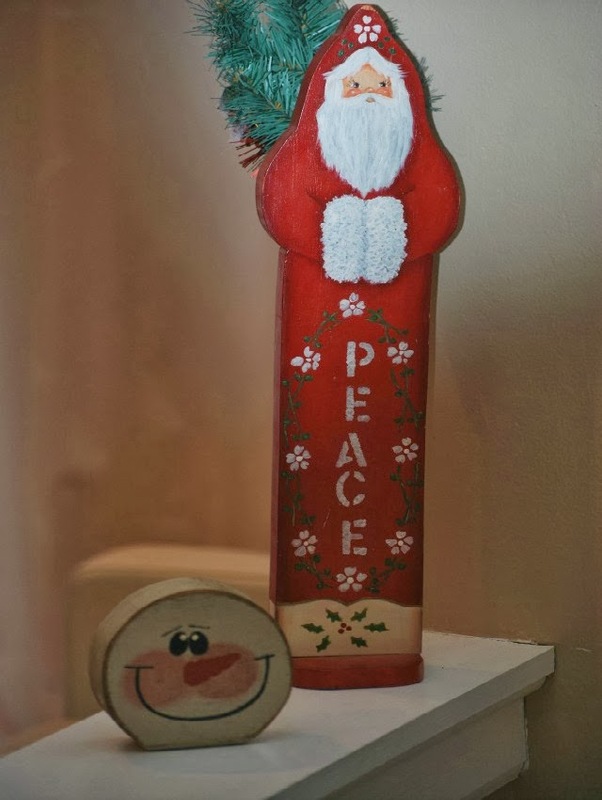 They find a home somewhere within the house every year no matter what since they were painted by my mother-in-law. She is missed dearly. I love this cute guy. 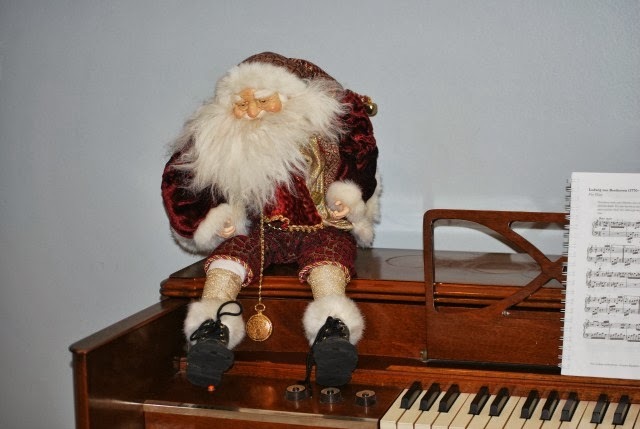 Years ago he had a string of ornaments hanging from one hand to the next but the string broke. It wasn't in me to part ways with him just because he didn't have his string of ornaments anymore. None of us are perfect. Maybe it's his imperfection that I love. 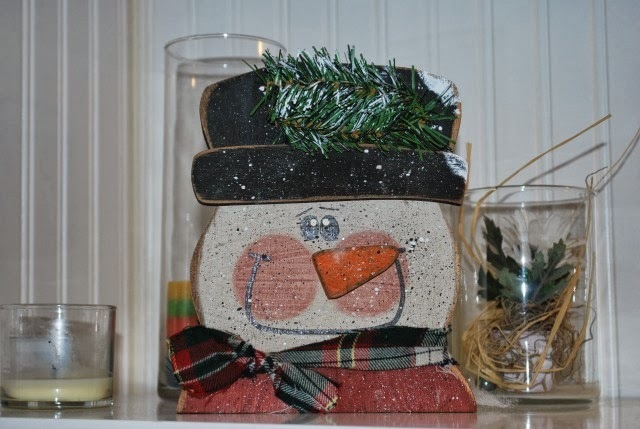 The carrot-nose snowman was once broken too. A bit of wood glue to re-attach his legs made it possible for him to still have a home every year. The window over the kitchen sink has been his favorite spot. Please ignore the dirty window! Fancy Santa has a story. (Once again, ignore the overly obvious cup stains on our piano.) 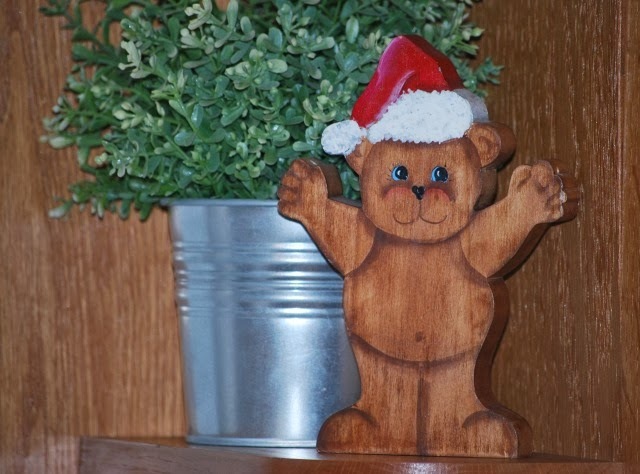 He was a gift from a former boss and his wife. They happen to be billionaire's and I'm sure Santa has quite the value associated with him. Their generous Christmas gifts every year made me smile as they never seemed to quite fit our simple home. I don't find Santa overly appealing but he makes an appearance every Christmas. Now this Santa I adore. He is usually the first to find a home. He too was painted by my mother-in-law. She was one talented lady. I miss her. She would be so proud of her son right now. 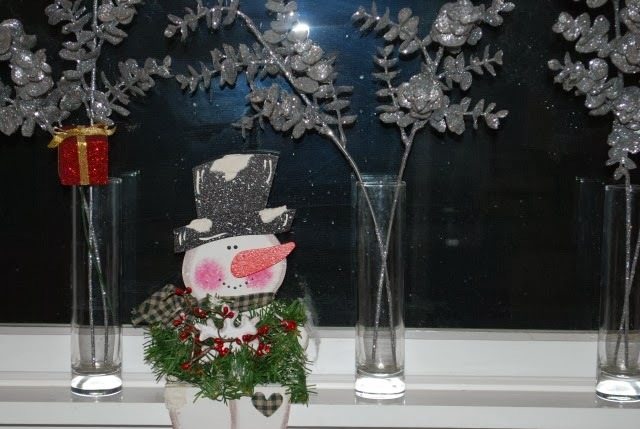 And the snowman...I have about five of these but only put out two this year. 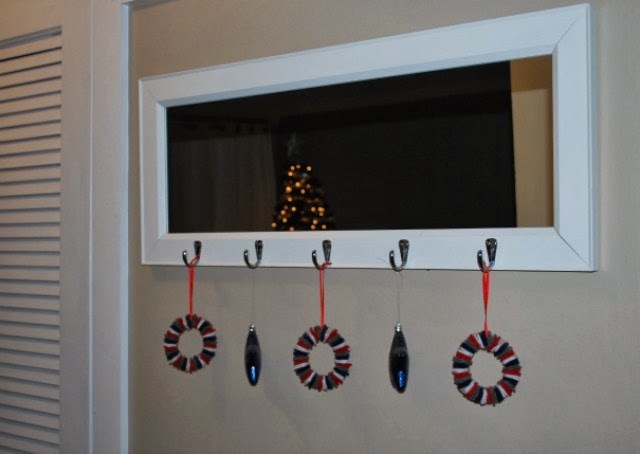 There is no good place in our home to hang stockings. Once they are stuffed they will need to go somewhere else or the table will fall over. Yes, I know they are rather plain. I'm all about simple! I do plan to have names embroidered on them. However, I've said that the past couple years and they still remain blank. Next year! In the background are a few of my favorite family photos. 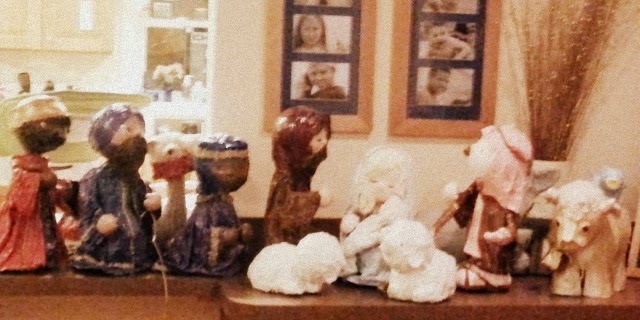 Before you compliment me on the nativity scene, it's not mine nor does it reside in my home. I stopped by to say hello to my parent's (they live right down the street from me) and seeing this always reminds me of childhood Christmases. My mother made each piece and they would be placed under the tree every Christmas. The picture doesn't come close to revealing their true beauty. I hung these ornaments a few years back. It was decided they could have a year round presence in our home after being hung as they go perfectly with our patriotic decor. 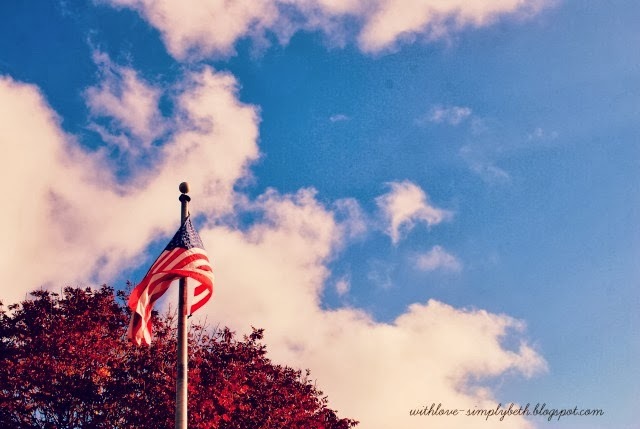 I love our Red, White and Blue. Taking a picture of the hallway did not prove to be easy. This was the best I could do. 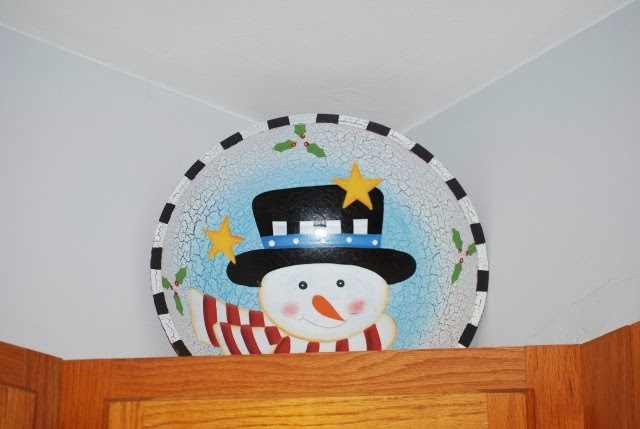 Our small bathroom actually has four snowmen in it even though you are only seeing two (up and down). While I'm not giving you a full view, I so love the way my husband did our bathroom. It's rather awesome. It took him a LONG time but it was worth the wait. I'm sending you Christmas greetings from my beautiful family. The picture above is from a few Christmases back but happens to be one of my favorites. I'm grateful my Navy son and his wife will soon by home for Christmas. And again, your prayers are appreciated for my family, and the many others who are celebrating Christmas apart. I miss this man something fierce right now. Merry Christmas dear friends. Wishing you peace, love and joy. It's decided...I'm sharing with The Nester where you can tour the homes of many. My son dropped me off at the emergency room ("ER") on his way to work the morning after my clumsy fall. He had to be at work way too early so the ER had little activity when I arrived. My son takes good care of me so as he dropped me off he asked, "How are you getting home. Mom." Oh I felt rather certain someone would come get me. My father is an early riser and I live right down the street from him. It didn't take the ER long to whisk me through X-ray and determine I had a small break on the top of my foot. They gave me an ugly black boot and sent me on my way. My dad did not respond to my text message asking for a ride as I had hoped. (He has been dealing with a bad hip and slept in that morning later than his norm.) As I sat in the waiting room trying to figure out how I'd get home I began to get a little antsy for a cup of coffee. You understand the drastic measures we will go to for a cup of coffee don't you? Sure, I probably could have found one at the hospital but YUK! There's a Starbucks right down the street!! Yes, I walked to the Starbucks with that ugly black boot on my left foot and my gym shoe in hand. It's winter here in Chicago so I bundled up as much as I could. Thankfully, Starbucks opens at an early hour; I arrived there about 6:15 am. Still no response from my dad. As I sat there in the corner of Starbucks with my cup of coffee and bagel I moved on to feeling sorry for myself. If my husband was home none of this would be happening. How will I survive these next ten months? Oh did I cry. The tears would not stop. Please God, bring him back home NOW! I returned home and my phone began buzzing. My dad called! Those fabulous neighbors also began responding too. Community heal us! Community healed my weary heart that day. My neighbors, friends and family did not abandon me. They simply were not available at that wee hours of the morning. As I continue to find blessings in this deployment, God blesses me daily through community. I read a post today that asked Who is your "Elizabeth"? God gave Mary the gift of Elizabeth. I am grateful for the many "Elizabeth's" He has placed in my life for this season. He has given me you and oh how I love you! I believe He brought us to our church specifically for this season. I am grateful for my neighbors who are helping me survive the winter season. My driveway and sidewalks have been shoveled twice. I'm blessed by a high school friend who checks in with me every Monday. And there are the other military spouses who understand the ups and downs of a deployment more than anyone else can. Don't you love how He gives us just what we need? 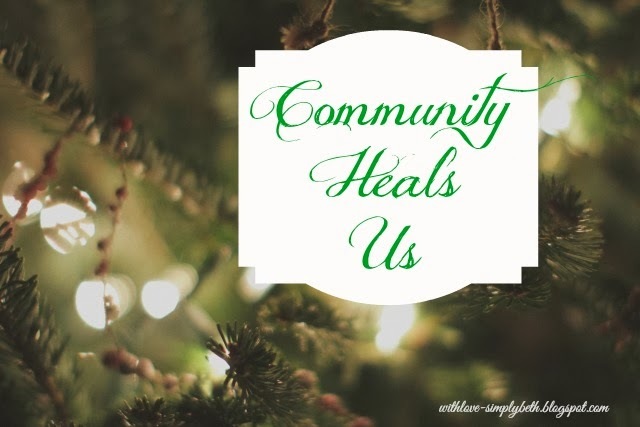 So yes, Community does heal us. Thank you, God, for this special gift. How has community healed you? Who is your "Elizabeth"? I was going to skip Friday Randomness today because the great thing about my weekly randomness post ... I can randomly decide not to do. :) But here I am sharing a few quick favorites from my week. "If God is really real and we are going to live with him forever, shouldn't he be the only thing? Shouldn't he be the controlling force of our lives? If we really believe this..."
I do not recall who led me to Shauna but her post was the reminder I needed to focus on being present this Christmas season over being perfect. Present Over Perfect. You will also be blessed if you read any one of the posts linked up for Three Word Wednesday this week. If you haven't joined in yet, would you prayerfully consider joining us soon? It has become a beautiful community of writing friends. Jocelyn Green speaks to the hearts of military wives celebrating Christmas without their husbands and reminds us that God is with us. "You may feel alone right now, but God is with you." You know I love Pastor Pete Wilson, right? He is the author of the book Let Hope In. I'm still giddy over the fact that he liked a Facebook status update of mine on my blog page. The status was about his book but I still find it super cool that he actually paid me a visit. This morning I stopped over to pay him a visit and he too is talking about how the nature of God is to come along side of us. Watch this touching video from parents of a child killed at Sandy Hook. Evil does not have to win. This video of an airline surprising passengers will make you smile and cry. What a delight! Thank you, WestJet. I love my fellow milspouse blogging friend Karin of Sunrise with a Six Pack. And I loved one of her most recent status updates. Thank you for sharing my friend. ~ Going to see a production of It's A Wonderful Life with another army wife. ~ Friends coming to your rescue when you felt stranded. ~ A broken bone in your foot not being quite as bad as you thought it would be. 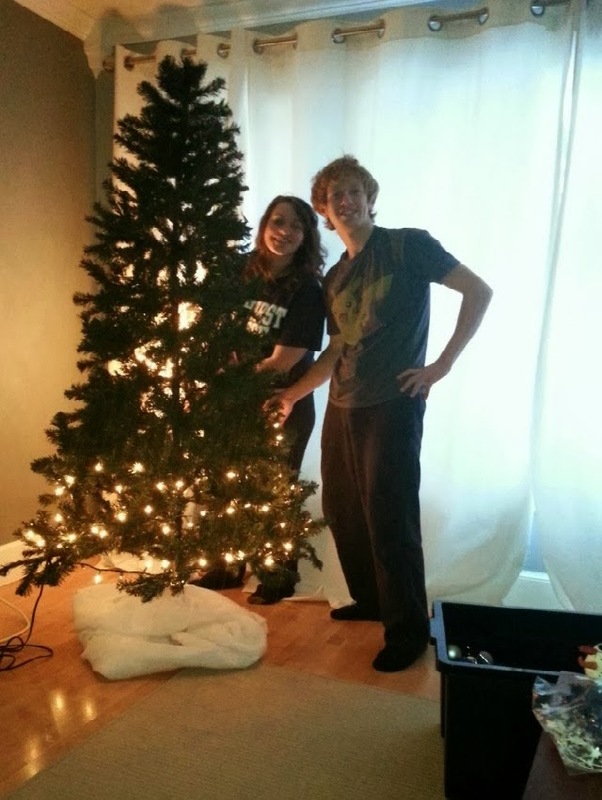 ~ Decorating the Christmas tree with my son and his girlfriend. ~ A much needed getaway to my favorite city, Washington, DC. ~ A job that spoils you! ~ Meeting up with a blogging friend for dinner. ~ Face-time with my soldier...my favorite time of the day. 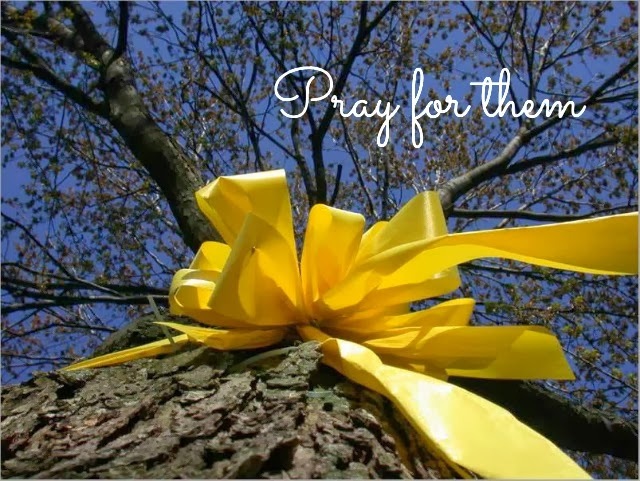 At a Yellow Ribbon event, an event held for the soldiers and family members to help prepare them for a deployment, an older lady stood up and said to the spouses of the soldiers, "Ladies, something will break." She had us laughing as she told stories of appliances secretly chatting with each other over who would be the first to go while the men of the house were away. According to this kind lady, something will break. It's not a matter of if; it's a matter of when. When doing my thing in the kitchen these days (I'm not really sure what my thing is since I don't cook.) I'd look at my various appliances, some older than others, and have visions of them talking among each other. My money is on the washing machine. (My washer and dryer happen to be in the kitchen...not by choice.) The machines acts possessed. When the spin cycle comes along it bounces like a mad woman (I'm gonna say she's a she). By the time she completes her cycle, she sits much further out than when she started. After every load of laundry I need to give her several pushes to put her back in her appropriate place. Surely she will be the first to go. All the bouncing and pushing must be having a negative impact on her longevity, don't you think? I've been waiting to see who would win. In the meantime, I was ready to take the pending breakdown of an appliance in stride. It would not get to this God Strong army wife! There would not be an emotional breakdown over anyone's demise. That would be anyone's but mine! I spent the better part of Saturday Christmas shopping. There were a few tears here and there knowing my husband will not be with us. But I have many reasons to be thankful so I kept pressing on focusing on how neither of us will celebrate alone. My boys and their ladies will be with me and my husband will have his Army family. 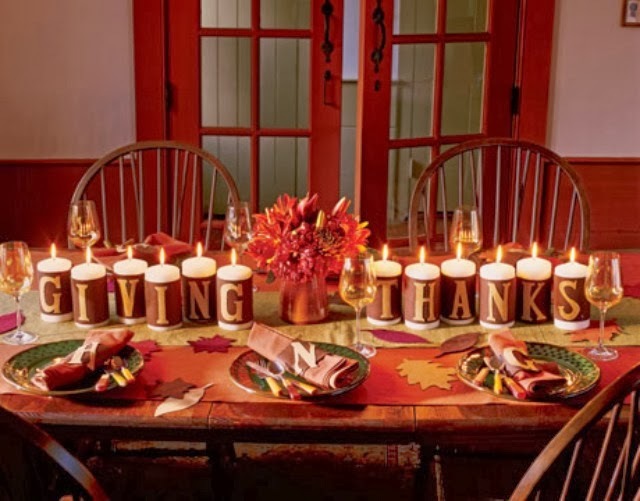 After shopping, I returned home eager to start decorating our home and began pulling out boxes of decorations. The boxes had all been placed in the garage with easy access by my husband before he left. He's always taking care of me. The decorations went up, including our fake tree (I did ponder getting a real one this year). 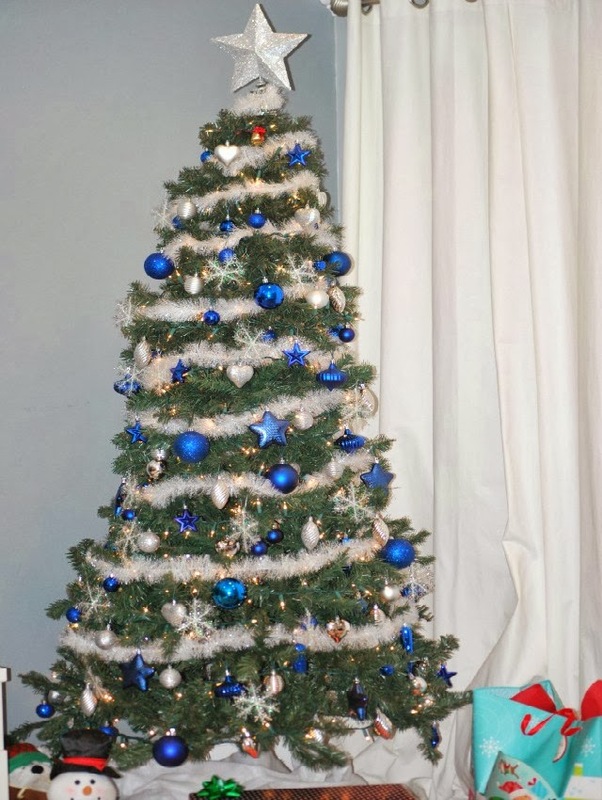 My son and his girlfriend were going to help me decorate the tree once they returned home that evening because the tree must be decorated together. Last year we also realized my son does a much better job of putting the lights on the tree. A little clean-up would not hurt while I waited so I went to return the tree box to the garage. And then it happened. I found out who would be the first to break. As I tumbled down the one stair to the garage...yes, a bone in my poor little foot would be the first to break. I heard the crack as I fell. I laid there for moment and then cried out, "No God. Not me. My money was on the washer. Pick her instead." I eventually made my way to my bed with a bag of ice in hand. Thankfully, my son arrived not too long after and he tended to his mom. We ordered pizza for dinner, I plopped myself on our comfy living room chair and we ended our evening by watching It's A Wonderful Life (decorating the tree could wait). I was handling my clumsy fall rather well, minus the quick cry out to God. Bedtime came and all I wanted was to curl up next to husband. I cried and cried. "God, please bring him back home!" Once again, I cried myself to sleep. I've decided there will be a Part 2 to this story. It includes a visit to the ER, doing something I now laugh at, feeling stranded, another emotional breakdown and God's amazing grace. So come back next week for the rest of the story. Do you know my friend Barbie Swihart of My Freshly Brewed Life? Because I love her so much I've talked about her here before. She also guest posted for Three Word Wednesday a couple months ago. You can read her guest post here. I'm not known for having a very good memory but I'm pretty sure I met Barbie through the Five Minute Friday link-up. And I'm pretty sure we connected because she would always leave encouraging comments on my post. She's kind of like that—always encouraging. Well...in my past two Friday Randomness posts I've shared with you a quote from Barbie's new book Coffee Talk With Jesus: Intimate Chats with the Savior. I had the privilege of being a part of the launch team for her fabulous new book and I'm super excited to highlight what I loved most and to give away a copy. Doesn't her book look pretty? I have a feeling it is even prettier when holding in your hands. I will be honest with you. I have not completely finished reading her book yet. How can I give a review of her book without finishing it first? I waited to begin reading as I knew exactly when her words would be needed. I know Barbie well enough to be certain her words would encourage. And I knew when I got on the plane to go see my husband one last time before he deployed that encouragement would be needed. So I got on the plane, pulled out a printed copy of the PDF version she provided me with and began reading. Immediately I felt Him with me; which is why I have yet to finish her book. It's time you don't want to rush. At the end of each devotional she provides space for reflection and prayer. My PDF copy has notes all over the place. As I look back at my notes, I can see how she truly did take me to a place of talking with Him. What I really want you to know is how the first fifteen days of her book helped to get me through one of the hardest things I have ever had to do. She took me to the place I needed to be—with Jesus. Because the strength I needed to say good-bye to my husband could only be found in Him. Have I told you her book also includes multiple recipes all including coffee as an ingredient? They sound so yummy. Time with Jesus + coffee = JOYFULNESS! Let the truth of those words soak in. Call on Him. Pray to Him. Seek Him. He is waiting for you. I've been so incredibly blessed by Ann Voskamp and her Advent devotional The Greatest Gift. I was also recently introduced to Christie Purifoy of There is a River by Shelly Miller of Redemptions Beauty. 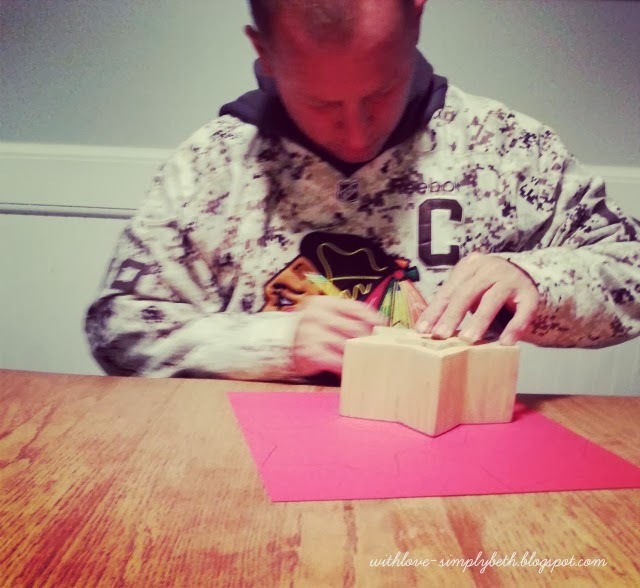 Come follow Christie as she writes through every day of Advent season. I'm back to the dilemma of trying to read too many books at once. I really need to focus on reading one book at a time. Maybe if people would stop writing such amazing books I'd have an easier time. (Giggling.) Seriously, have I ever told you as a young adult I hated to read? That surely is not the case anymore. But what am I reading? I know I'm way late to read Jennie's book but God's timing really is always perfect! I may need to give away a copy at some point too. Don't you love giveaways? It could become a habit of mine to giveaway a copy of the books I really, really love. Be sure to come by on Monday (or Tuesday possibly) as I will be sharing a review of Barbie Swihart's new book Coffee Talk with Jesus. And well...there will be a giveaway too! To read what others have said about Barbie's book click here. From Day 5 of her book, "You feel as if you don't belong. You could be in a room filled with people and still feel as if no one truly sees you. But I see you there, restless in your chair, cradling that cup of warm tea in your hands." You honestly do begin to feel the presence of Jesus as you read this book. The first Friday of every month the contributors of Circles of Faith share what they are reading. Come take a look and discover books to add to your must read list. If you have recently written a review, you can also join in by linking up your post or share in the comments section of their post. I visited Jennifer of A Heart For the Home for the first time through a link-up at Woman to Woman Ministries and her post Embracing your Season felt as though it was written specifically for me. Thank you, Jennifer! I love the new people I meet through link-ups. You must listen to this new song just released by David Crowder called I Am off his Neon Steeple album. I heard it for the first time while working out this week and the lyrics blew me away. 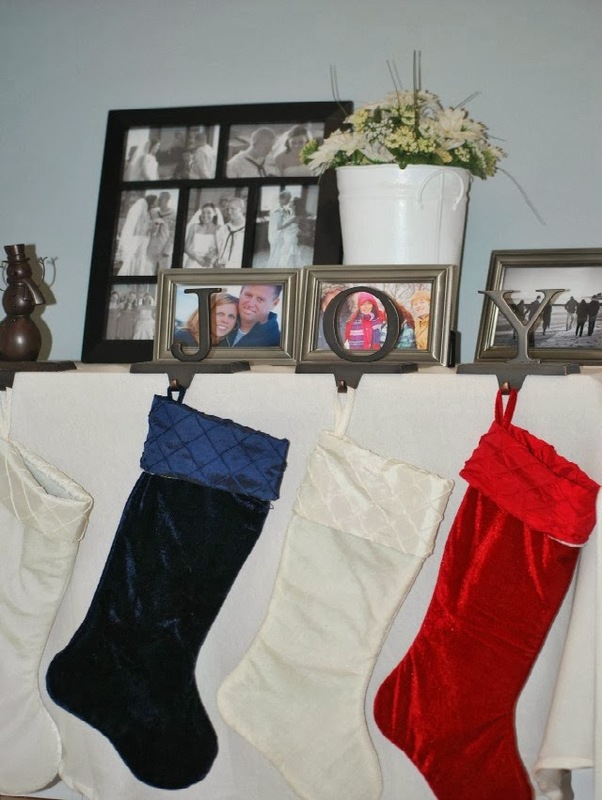 There's no end to amazing grace"
Looking for cute and meaningful stocking ideas or inexpensive gifts for a dear friends? Come see what you can purchase from Dayspring for under $5.00. Oh my! I had no clue. I'm being selfish again! 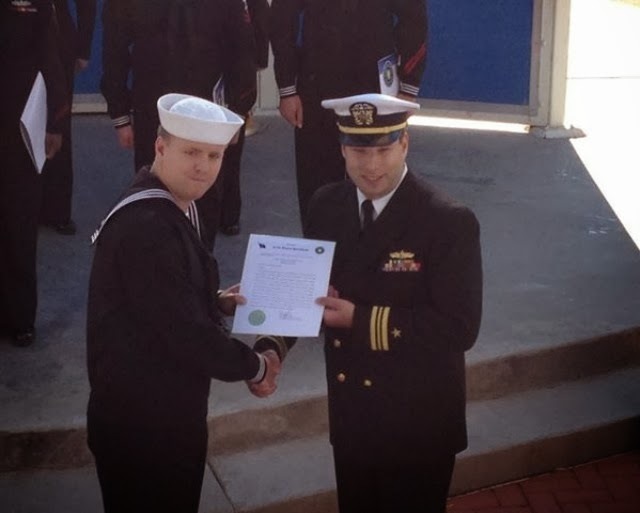 This is my son receiving a "Flag Letter" for a job well done on funeral detail. We are very proud of him for all he has done to honor and remember our fallen. Isn't he handsome too? 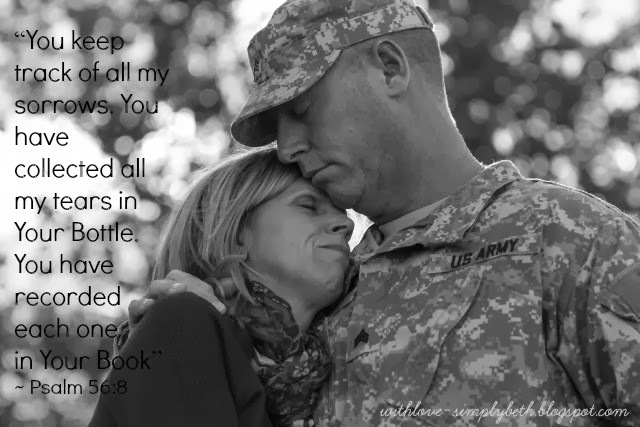 ~ Books filled with encouragement for military wives. Thank you, Sara Horn, Jocelyn Green and Kristen Strong. ~ LHC responding quickly to my request for copies of sermons to send to my soldier. ~ Photographs. When I'm missing him I can stare at pictures of him. ~ An amazing few days in San Antonio together before our last good-bye. ~ A Thanksgiving brunch on the patio of a restaurant along the San Antonio River Walk. ~ My younger son now cooking dinner for us every evening. Super yummy! ~ Lots of phone calls from friends. 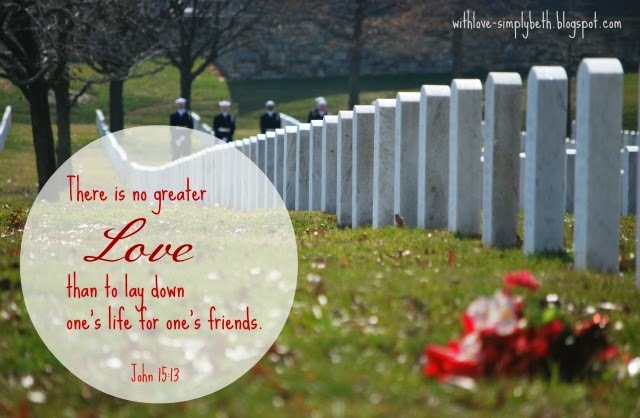 A dear friend from church told me before I left to see my husband for the last time before he deployed that God would give us the grace needed to say good-bye right at the moment we needed. My husband and I were truly blessed to have three full days together in San Antonio before saying goodbye. We took many walks along the River Walk holding hands and ate far too much. We enjoyed quiet evenings in our hotel room and slept in every morning holding each other. A glorious time indeed! Then came the day neither of us wanted to come. We stopped many times while packing our bags that morning to take in another long hug. We had a two hour drive back to the airport. Of course we had to eat another meal first before beginning our journey. After taking our seats for lunch my husband pulled my stool closer to him. This warmed my heart more than I can say...he simply wanted me right at his side. "God, please slow down these next couple hours." As we made our way to the airport we were both quiet in anticipation of what came next. We held hands lost in our own thoughts. The moment I saw the airport those tears began to fall. I was ready for that grace my friend said God would give us because my heart hurt. Taking deep breaths did not stop the tears. We walked in to that dreaded airport; my husband looked at me and said, "You can't cry yet." "God, can I please have that grace now?" I was flying out of a small airport in Texas primarily used by military since it's located near one of the largest military bases in the U.S. There were no lines to get through security and my gate was right on the other side of security. Because of this, we were able stay together almost right up until my departure time. We found a table and instead of sitting on my own chair I sat on his lap. I wrapped my arms around him and we both sobbed. "God, can we please have that grace now?" In that moment, He gave us both just enough grace to calm our cries. Instead of crying we held each other tightly. I whispered to my husband, "You come home to me, Dear." Tears came again when we had our final embrace. But God did give us everything we needed to let go. I crossed through security with one last look back at the man I love and knew God was with us. The past couple days have been hard. My heart hurts deeply. 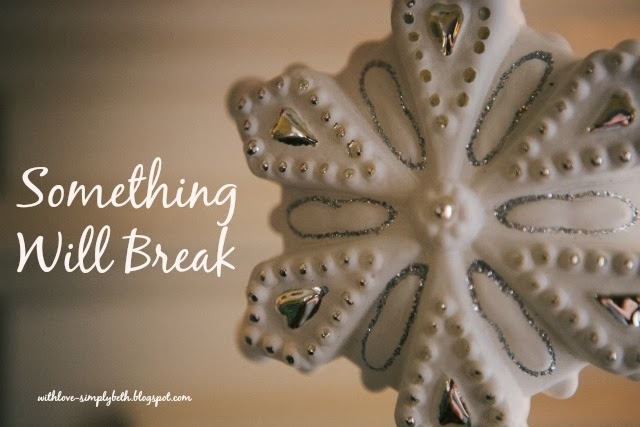 I've debated whether or not to take a break from blogging. Calling it quits for the month has sounded somewhat appealing. Words said by my pastor on Sunday lead me to keep on writing. "We can't make this without Him." Why did those words from my pastor convince me to keep on writing? I know I can't make it without Him and I don't want you to try and make it without Him. I have read many posts and devotionals these past couple days about Advent season and how this is the time when we wait expectantly and with hope for our promised Savior. I'm in a season of waiting as I now wait for my husband to return home. But I'm also waiting for Him. Will you join me in waiting for His arrival? As we wait, I pray He reveals Himself to us in a way that increases our faith and trust in Him. And may we be reminded that we never wait alone. He is with us. Oh friends, I'm super excited today to share with you my dear friend Joanne. If I could do cartwheels I'd be doing them right now. She is a delight. She is all kinds of awesomeness. I was so touched by her excitement when I asked her to guest post for today's Three Word Wednesday. While I told her she did not have to write about Thanksgiving, I'm blessed by the words God placed on her heart to share with us. This is her first time guest posting so please give her a warm welcome. After reading her post be sure to go visit her website: Days and Thoughts. You must get to know this fabulous lady who has a big heart for God. It has continued to amaze me that my two granddaughters are so different from each other. I knew that my two children were different from each other but expected that as one is a boy, the other a girl. But with two girls, sisters, I thought they would be more alike. Lord, don't you care that my sister has left me to do the work by myself? Tell her to help me! (Luke 10: 40, NIV). Martha was doing exactly what women in that day would have been expected to do ... prepare and serve the meal. She was the one who had opened her home. Surely she had to recognize the amount of work that would be involved for preparing a meal for Jesus and the disciples. It was a pretty good size group. And men have good appetites! She seems to want Jesus to tell Mary to get up and go give Martha some help. "Martha, Martha," the Lord answered, "you are worried and upset about many things, but only one thing is needed. Mary has chosen what is better, and it will not be taken away from her." (Luke 10: 41-42, NIV). A disciple learns the ways of another. They are trained by the Teacher. They adhere to their teachings and doctrines because they know Him. They become like their teacher or mentor. I think He would say those very same words to us today. We can so get busy with activities, good ones at that, and mistake that to be relationship and time spent with Him. But that is not what He wants from us. He wants us to take the time to be with Him. To learn His ways. To be a disciple. As we get busy with Thanksgiving and family preparations, may we think about these two sisters. Martha was distracted with the preparations and missed the most important which was in front of her. Jesus pointed out that Mary had chosen to pause and spend time with Him. He tells us that she made the better choice. This Thanksgiving may we remember to make the better choice. For it will always come down to choice and the choice is ours. And I include this message shared today from Faith Deployed: Daily Encouragement for Military Wives as it spoke to the scripture I shared with you. 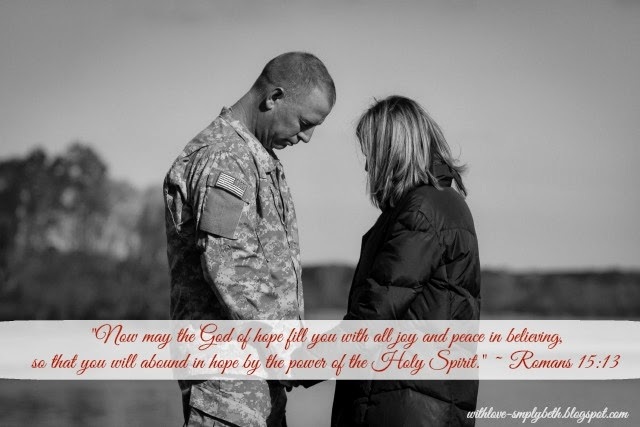 Post by Faith Deployed: Daily Encouragement for Military Wives. "We, too, must choose each day to serve the Lord. It won't prevent the difficulties ahead or bring wars to an end. But oh, what freedom to be able to choose the one thing that can bring us peace, even on the hard days. Since God has allowed our struggles, He can use them—even deployment. Nothing in our lives will be wasted when we choose to place it in God's sovereign hands by serving Him." "Will you give me your whole heart — undivided, yielded, and surrendered? Your heart is fragile, yes, but in the palm of My hand, it is made strong. In my hands you are secure and loved, without conditions, and cared for deeply. Trust Me. I will not hurt you." ~ Coffee Talk with Jesus: Intimate Chats with the Savior, by Barbie Swihart of My Freshly Brewed Life. Her book will be releasing soon! I get to be part of the launch team and give you a quick glimpse. Both of these book are GOOD for the soul! Check out his recent announcement here. I love how he is offering hope for you and then for you to give hope to another. You only have until December 1st so act quickly. I already have a copy (as you know!) but I'm purchasing another so I can then give away two copies. LOVE!! My friend Karin of Sunrise with a six pack took my breath away with her post The One Word I Want To Leave With My Children. Oh my, you must read. Michelle DeRusha delivers a beautiful reminder of the only place to go When You're Looking for an Endorsement. "When you go looking for endorsements, look no further than God..."
I don't recall how I stumbled upon the post 26 Acts of Kindness in 26 Days from The Larson Lingo. It made me think of my friend Jenn from Running This Thing Called Life because she has this amazing gift of dishing out kindness daily and then it hit me how we should all be doing at least one thing every day to bless another. There really are so many simply things we can do. If you have not read, I highly suggest picking up a copy of the book, The Power of a Praying Wife, by Stormie Ortman. We need to be praying for our men. Let me add, you should read this book even if you are not married; you can pray for your future husband! 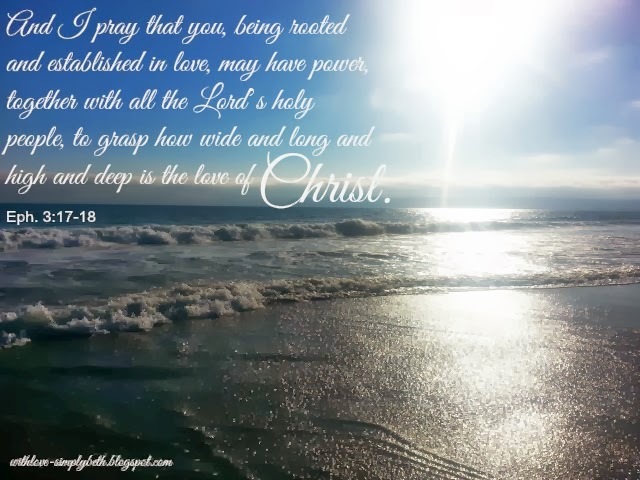 Jennifer of the Unveiled Wife also shared this week 25 Verses to Pray Over Your Husband. I completely agree with her when she says, "prayer is a vital part of a successful marriage." "How many kings step down from their thrones? How many fathers gave up their sons for me?" Okay, these lyrics had me in tears this week! I saw this shared in many places this past week... Homeless Man Breaks Out in Gospel with God of Second Chances. Beautiful! 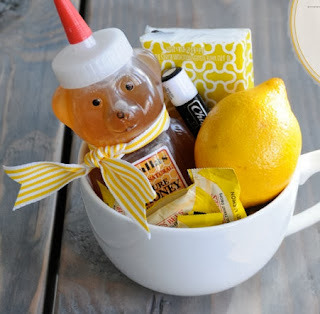 Speaking of blessing others, Jenifer Metzger of Sweet Blessings shared a Pinterest Pin on her page this week that was adorable and a great idea for lifting someone spirits. ~ Time to refresh my soul with God. ~ Sending my soldier text messages to tell him how much I love him. ~ More text messages and emails from family and friends to say they are thinking of us. ~ Text messages from him just to say good morning. ~ AA changing your flight without fees after his leave time was extended. ~ Hotel contacts who take care of you. ~ Discovering my soldier is keeping a journal. ~ Rain...I feel it helps welcome my sometimes dreary mode. ~ Picking up the phone and having someone come do your fall clean-up. Do you have a favorite from your week? Share away in the comments. I always love hearing from you. A new season is here. There were prayers for it not to come so quickly. In many respects it did not. We had a year to prepare. One thing I've learned, you are never fully prepared. You can have everything checked off your to-do list yet you are still not prepared for the day when your husband walks out of your home and will not return for at least ten months. You cannot prepare for how that day will feel. I held him tightly the night before he left as we lied in bed. Eventually, I gave him space since he needed a good night's rest. My hand continued to stay over his; I could not completely let go. Morning came too soon. We waited as long as we could before waking our son so he could say good-bye. No matter how old your child is, watching them say good-bye is almost more than you can bear. It wasn't time for us to say good-bye. I will see him again soon. We will have a few days to ourselves over the Thanksgiving holiday before he journeys overseas. While it wasn't good-bye for us, the time had come to begin the process of accepting he would not be home again for far too long. People ask if he will be gone for an entire year. I tell them not quite. There are times I get, "Oh that's not too bad." Can I say any length of time apart from your spouse is too long? I know they mean well so instead of getting upset I pray for God to give me the words during this new season to not only minister to military families but to bring awareness to others of the sacrifices made by our military families. So I begin my new season as a wife with a husband deployed (mobilization stage). I do not know what it will look like. Only God knows. On the first day I missed him something fierce as soon as he boarded the plane. The gloomy day was welcomed as it matched my downcast mood. It took every ounce of strength to not let the loneliness I felt consume me. I did finally succumb to the bed and cried off and on until sleep came. I do not need to be afraid. "I have set the Lord always before me. Because He is at my right hand, I will not be shaken." ~ Psalm 16:8. On day three I'm reminded to find the blessings in a deployment. And whatever trials come my way I will considered it all pure joy. And I will give thanks to Him for He is good ALWAYS. 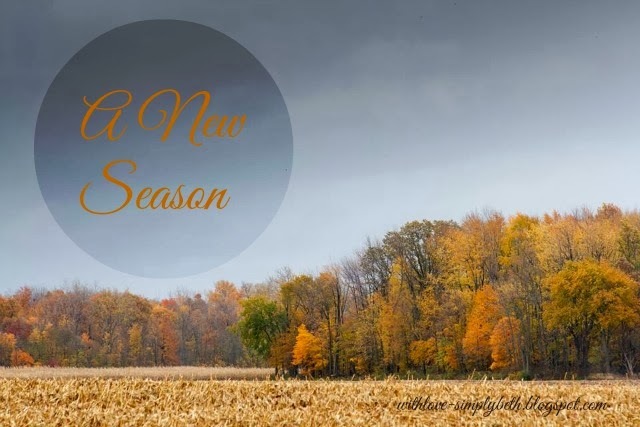 Is there scripture you turn to when a new season is upon you? I'd love for you to share. "Eventually everything we hope for will disappoint us. Every circumstance, every situation that we're hoping for is going to wear out, fall apart, melt down, and go away. When that happens, the question then is about your deeper hope, your foundational hope, your fallback hope when all your other hopes have disappointed. All of Scripture points to one man, one God, not because he gives us everything we're hoping for but because he is the One we put our hope in." Believe it or not I finally finished reading this amazing book. My reading has been a bit slow lately. What is next on my list? Coffee Talk With Jesus -- a book soon to be released by my lovely friend Barbie Swihart of My Freshly Brewed Life. I'm super excited to be part of the launch team. I also think I really read the words from Romans 15:4 for the first time and I loved how Shelly paraphrased in her post, "Their stories were written so we would remember what hope looks like." Please take a moment to read and be sure to watch the video! I'm being a bit selfish and sharing a video of my husband's unit being honored at the Chicago Blackhawks game this past Sunday. You can watch here. Really, it's super cool! Have I told you how proud I am of my soldier? I'm bursting with pride! A Post by Wives of Faith. I received a touching email on Tuesday from my younger sister and knew I needed to share with you. Is this not just awesome?!?! Would you consider joining him by making a donation to UNICEF? You can donate here. My friend Amy Sullivan is sharing at Mercy Notes on the impact we have when we simply show up. "...rule number one in creating community was easy: show up." A great reminder for us all. Lauren of It's A Wilderness Out There...And in Here Too blessed me deeply on Tuesday with her Share the Love Tuesday post. My hope is always that others see through my writing how deeply God loves us so her kind words just about made me cry. I love you, Lauren, and I'm very grateful for your friendship. ~ Nieces who makes signs for you to help cheer on my husband and his unit as they are honored at the Chicago Blackhawks game. ~ Squeezing in another celebration with family because they simply want more time with him. ~ An amazing Aunt who treats us to a special dinner at her place. ~ Neighbors who invite you over for dinner for a final good-bye and then invite other neighbors over before calling it a night. ~ Children of those neighbors who make a special parting gift for their favorite soldier. ~ A neighbor who makes you chocolate covered Oreo balls...super yummy! ~ One last dinner with two of our favorite couples from church. ~ A coworker who comforts you when she catches you crying. ~ Military spouses who warm your heart and remind you we walk this journey together. ~ A family date night via Skype. 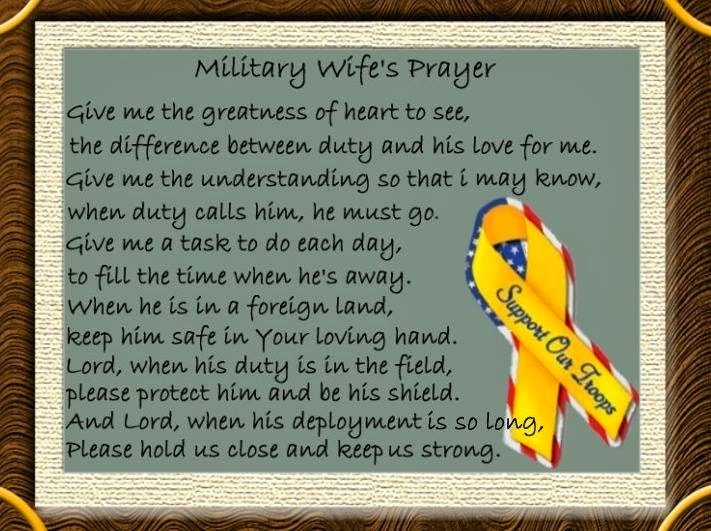 Pray for the soldiers in my husband's unit. Pray for the families who support these brave men and women. Pray for all who continue to serve our country. Pray for our Gold Star families. 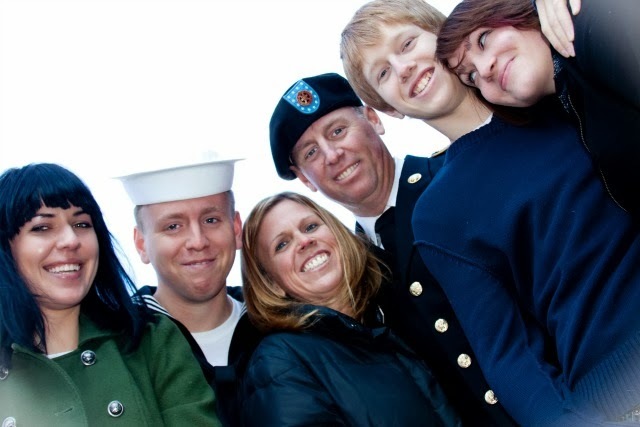 Pray for God to move in to the lives of our military families. Pray for them to know Him. Pray for them to put their trust in Him. Pray that they know how deeply they are loved. Pray they know He is always with them. Friends, thank you for all your prayers. They continue to be felt and are greatly appreciated. My husband has only a few more days at home so please forgive the delay in getting by to read the posts you link-up. Thank you for being a part of this Three Word Wednesday community. Your words are always such a blessing to me. How about we skip any kind of introduction this week and go straight to randomness. Sending hugs to all of you because...well, I just love you! This verse has been on my heart since shared by a Chaplain last weekend. Oh how He refreshes and satisfies! Pastor Pete Wilson writes in this portion of the book what I wish I could say in the Love Others page of my blog (which still remains blank). If it was possible the entire chapter would have been copied and pasted here. The military spouses and significant others from my husband's unit rock! God has placed some pretty amazing ladies in my life. There have been many wonderful moments with them this past week. God is SO good! Courtney of Women Living Well pulls from the archives but her post When Your Home Does Not Feel Like A Haven was a first time read for me. She turns to Psalm 23 and drinks in a glass of His living word. Because I love all these ladies I'm encouraging you once again to read a few of the posts from those who linked up for Three Word Wednesday. The newest contributors are at #15, #18 and #20. Let's show them some love. Would you also consider joining us next week if you haven't already? Every service member should receive this kind of welcome home: 13 Marines Get Impromptu Welcome Home. And I love that this took place here in Chicago at O'Hare Airport. Kudos to the USO for all they do to support our troops. The first Friday of every month the Circles of Faith contributors are sharing what they are reading. There are two ways you can join. Check out the "First Friday Book Faves" to find out more. Surprise, Surprise — I'm over there recommending Let Hope In. My sweet, sweet friend Bev of Walking Well With God is giving away a copy of Ann Voskamp's book One Thousand Gifts: A Dare to Live Fully Right Where You Are and a DaySpring coffee mug. To enter, subscribe to her blog during the months of November and December. I'd love both but honestly what I love more is her heart and I love when her new post is emailed to me on Thursday morning. I've been horrible with responding to your comments recently. Please forgive me! My husband has my full attention right now so less and less time is spent in front of the computer. I do read every one of them and I'm grateful for ALL of you. Your prayers for my family continue to be felt. What could one have to say about a dine-in? 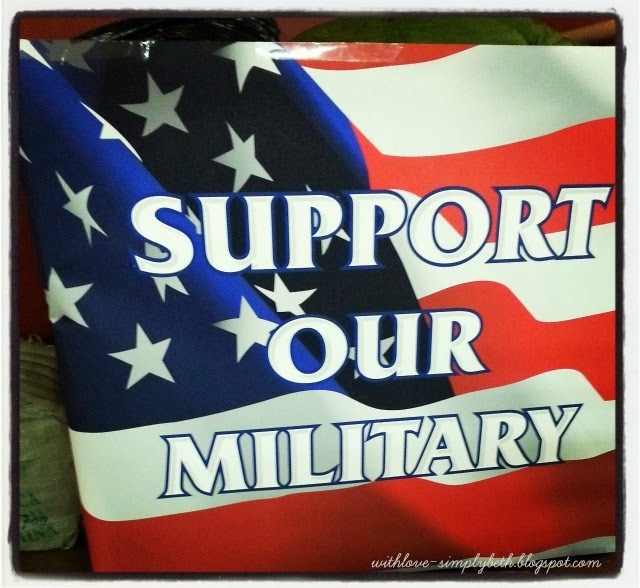 I'm all giddy over the dine-in we had at a local restaurant earlier this week to support my husband's deploying unit. We continue to be blown away by all the love and support. I wish you could all go over to Coach's Corner to show them some love. I'd love to leave you with great words today but I have none. 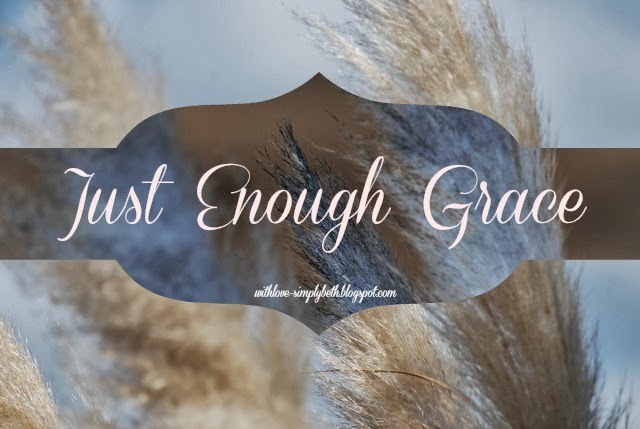 The past couple weeks I've kept my Three Word Wednesday posts short and have shared with you words that have inspired me from the book Let Hope In and left you with encouraging lyrics from the song "Your Grace Finds Me." What do I have for you this week? A wonderful weekend was spent getting to know the soldiers my husband will deploy with and also meeting their family members. There is a bond among military families that is hard to explain. Before the weekend I did not know these people. Now we are a great big family. I'm grateful we take this new and scary journey together. God really does give us just what we need. My husband and I attended a Military Chapel service on Sunday and the Chaplain opened up with the verse from Jeremiah 21:35, "I will refresh the weary and satisfy the faint." During his brief sermon he said words that have stuck with me. "Come to Him and He will give your soul a place to breathe. He will give you rest." Even though the sermon was short, I still found myself taking notes. I look back at what I wrote and see the words "He will never leave you." As I read them I begin to breathe in His great grace. Maybe the great words I want to leave you with are: He is enough. I can feel the loneliness of a year without my husband. My heart is weary and the road ahead looks dark. There is a part of me that wants to crawl in to a hole and hide until he returns. But God (remember, "But God" is always good news) is my strength and my portion forever. He is enough. Is your heart weary? Accept His invitation to come to Him. Apart from Him we will never find the rest our souls long for. In the darkness He has treasures waiting for us. I promise you, He is enough. He will refresh and satisfy. How do I know this? Because our God keeps ALL His promises. When we accept His invitation He gives us everything we need. Breathe in His great grace. Veterans Day is only a week away but we shouldn't wait for a holiday to show our support to our veterans and serving military. While Veterans Day is different from Memorial Day, I also believe those who made the ultimate sacrifice should be remembered daily. 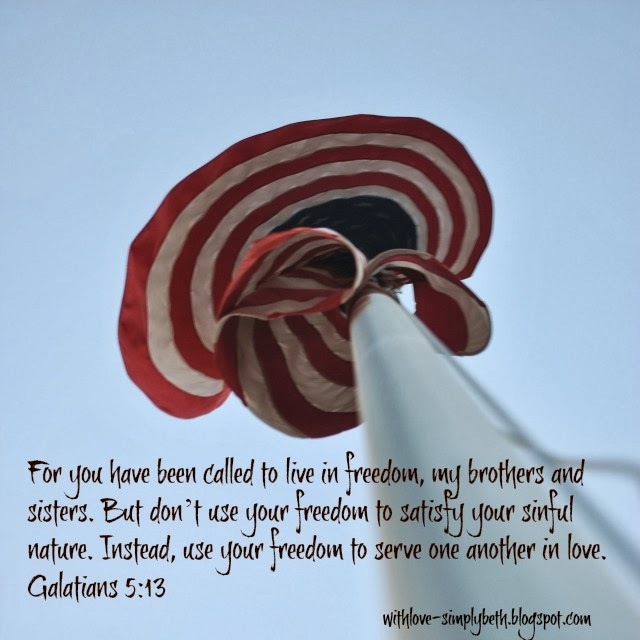 I share these five ways to serve them not because of a holiday that tells us we should. I share because we are to carry the burdens of others. Their burdens are heavy my friends. Let's help lighten them. Taking a moment to say thank you goes a long way. You can also request thank you cards from Wreaths Across America to hand out to a veteran/serving military when saying thank you. You only pay the cost for shipping ($5.00). There is tremendous power in a heartfelt prayer. 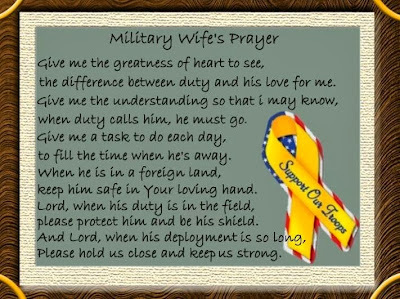 We need to keep our troops and their families in our prayers daily. 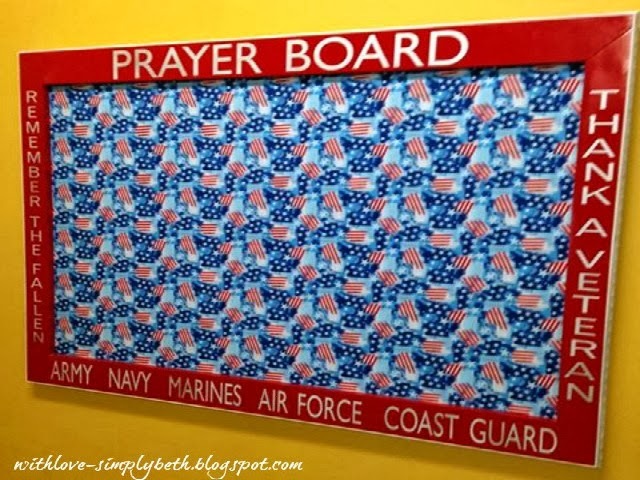 How about having a military prayer board at your church? Cut out patriotic stars to use for prayer requests. The number of homeless veterans in our country is growing and the colder months are upon us. Partner with a local VFW or military support organization to collect socks and gently used sleeping bags to be distributed to the homeless in your area. 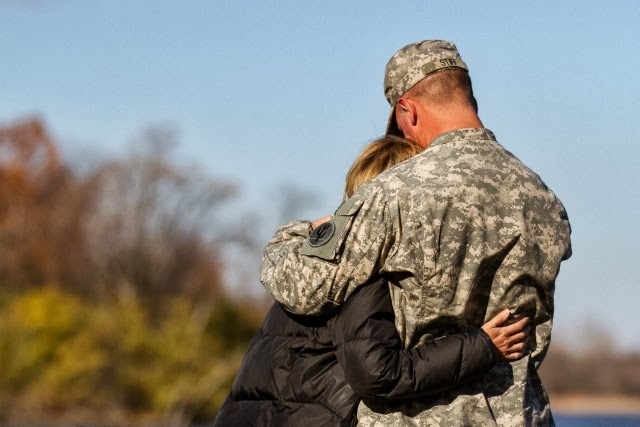 You can also partner with Operation Support our Troops - America to collect needed items to be included in comfort care packages sent to our troops serving in harms way. 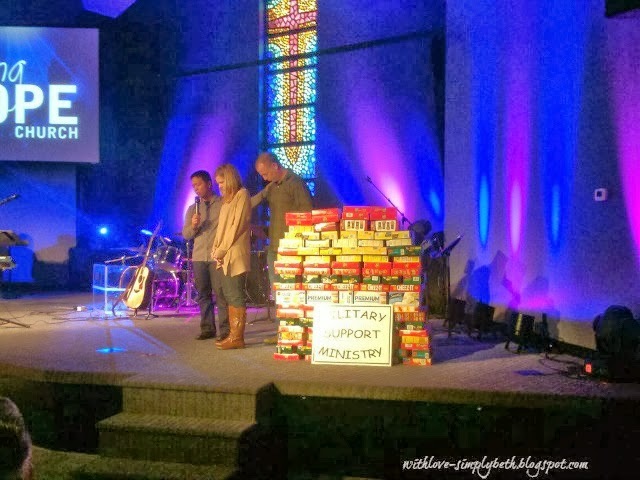 Living Hope Church collected 300 lbs of crackers last year to be included in comfort care packages. For only $15.00 you can sponsor a wreath to be placed at the grave site of a fallen hero this holiday season. Sponsor a wreath here. What can you do today to help carry their burdens?